The public sees the nation’s tax system as deeply flawed: 59% say “there is so much wrong with the federal tax system that Congress should completely change it.” Just 38% think the system “works pretty well” and requires “only minor changes.” These opinions have changed little since 2011. With the April 15 filing deadline approaching, Americans’ top complaint about the tax system is not the amount that they pay in taxes. Rather, it is the feeling that some corporations and wealthy people do not pay their fair share of taxes. Just 27% are bothered “a lot” by the amount they pay in taxes. 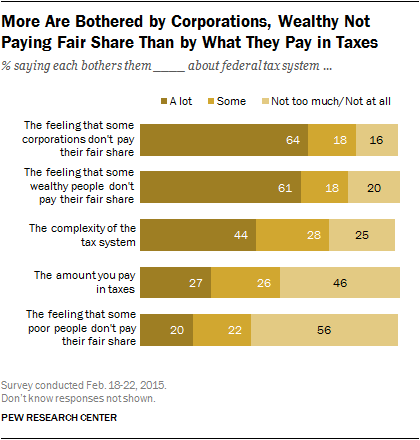 By contrast, 64% say they are bothered a lot by the feeling that some corporations do not pay their fair share of taxes, and 61% say the same about some wealthy people failing to pay their fair share. In views of other aspects of the tax system, 44% say they are bothered a lot by the complexity of the system, while just 20% are bothered a great deal by the feeling that some poor people are not paying their fair share of taxes. When those who cite multiple frustrations with the tax system are asked what bothers them most, a similar hierarchy of concerns is evident: About a quarter of the public (28%) says they are most bothered by the feeling that corporations do not pay their fair share and 25% say the same about wealthy people not paying their fair share. Fewer (19%) point to the complexity of the tax system, while much smaller percentages cite the amount they pay in taxes (7%) and the feeling that the poor don’t pay their fair share (4%). The national survey by the Pew Research Center, conducted Feb. 18-22 among 1,504 adults, finds that about half (53%) say they pay about the right amount in taxes, considering what they get from the federal government; fewer (40%) feel like they pay more than their fair share in taxes. Just 4% say they pay less than their fair share of taxes. These views have changed little since December 2011. However, there is a widening partisan gap in several public attitudes about the federal tax system. Today, Republicans are 20 points more likely than Democrats to say they are paying more than their fair share in taxes (50% vs. 30%). In the 2011 survey, nearly identical percentages of Republicans (37%) and Democrats (38%) said they were paying more than their fair share. While there is considerable support for Congress completely changing the federal tax system, Americans remain divided over the overall fairness of the current tax system: 4% say it is “very fair,” while 46% view it as “moderately fair.” About as many people say the tax system is “not too fair” (24%) or “not fair at all” (24%). These views also have changed only modestly since 2011. What Bothers You About the Tax System? Frustration with the feeling that some corporations and wealthy people do not pay their fair share of taxes is shared widely across demographic and partisan groups. 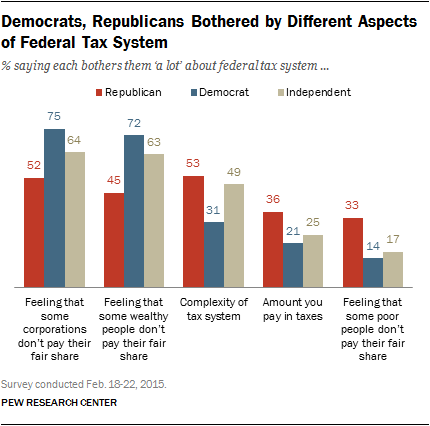 Fully 75% of Democrats are bothered a lot by the feeling that corporations do not pay their fair share of taxes, and 72% say the same about wealthy people not paying their fair share. Fewer Republicans are bothered a lot by some corporations (52%) and wealthy people (45%) not paying their fair share. Still, these rank among the Republicans’ top concerns among five items tested. 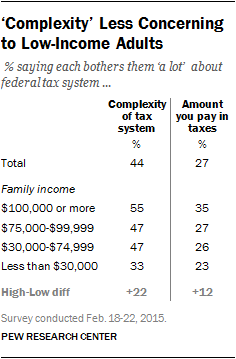 About half of Republicans (53%) also say they are bothered a lot by the complexity of the tax system. By comparison, just 31% of Democrats say this aspect of the system bothers them a lot. Republicans also are more likely than Democrats to be bothered a great deal by the amount they pay in taxes (36% of Republicans vs. 21% of Democrats) and the feeling that some poor people do not pay their fair share of taxes (33% of Republicans vs. 14% Democrats). Conservative Republicans are the only ideological group to say they are as bothered by the poor not paying their fair share of taxes as by the wealthy not paying their fair share (38% each). Among moderate and liberal Republicans, 64% are bothered a lot by the wealthy not paying their fair share, while 20% say the same about the poor not paying their fair share. Among Democrats, 72% are bothered a lot by the wealthy not paying their fair share of taxes; just 14% express the same concern about the poor failing to pay their fair . Majorities across income categories express irritation over the prospect of wealthy people and corporations not paying their fair share in taxes. However, those with higher family incomes are more likely than those with low incomes to be bothered by the complexity of the tax system and the amount they pay in taxes. Among those incomes of $100,000 or more, 55% are bothered a lot by the complexity of the tax system; nearly half (47%) of those with incomes between $30,000 and $75,000 say the same. This is less concerning to those with incomes of $30,000 or less (33% bothered a lot). Roughly a third (35%) of those with incomes of at least $100,000 are bothered a lot by the amount they pay in taxes compared with 23% of those with incomes less than $30,000. For the most part, views of the federal tax system – such as views of the fairness of the tax system and whether it should be completely changed – have not changed a great deal since December 2011. Currently, just 4% see the tax system as very fair while 46% say it is moderately fair. About half say it is either not too fair (24%) or not at all fair (24%). Whites are more critical of tax fairness than are blacks or Hispanics: 53% of whites say it is not too fair or not at all fair, compared with 38% of blacks and 35% of Hispanics. The partisan differences in attitudes about tax fairness are relatively modest: 55% of Democrats say the system is at least moderately fair as do 49% of Republicans and 48% of independents. However, the partisan divide is sharper in opinions about whether people feel they are paying their fair share of taxes, considering what they get from the federal government. Overall, about half of the public (53%) say they are paying the right amount in taxes considering what they get from the federal government. Four-in-ten (40%) say they are paying more than their fair share while just 4% say they pay less than their fair share. Currently, 56% of conservative Republicans say they are paying more than their fair share of taxes, by far the highest percentage of any ideological group. In 2011, 41% of conservatives said they were paying their fair share of taxes. Democrats are less likely to say they pay too great a share of taxes than did so in 2011 (30% now, 38% then), with the decline coming about equally among conservative and moderate Democrats (eight points) and liberal Democrats (seven points). 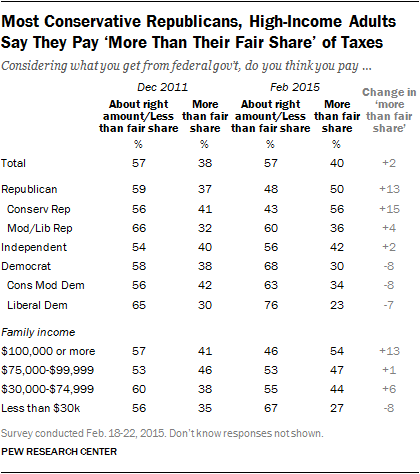 About four-in-ten independents (42%) say they pay more than their fair share of taxes, little changed from 2011 (40%). People with incomes of at least $100,000 are more likely to say they pay more than their fair share of taxes than did so in 2011 (54% now, 41% then). Those with family incomes of less than $30,000 have moved in the opposite direction: 27% say they pay more than their fair share, down from 35%. Opinions about whether the tax system needs to be fundamentally changed also have become more partisan since 2011: In that survey, 63% of independents, 60% of Republicans and 55% of Democrats said there is so much wrong with the system Congress needed to completely change it. Republicans, especially conservative Republicans, have become more supportive of overhauling the tax system while Democrats have become less supportive. As a result, Republicans are now 18 points more likely than Democrats to say that the tax system needs to be fundamentally revamped: 66% of Republicans say this, compared with 48% of Democrats. Independents’ views are unchanged since 2011; currently, 63% say the tax system should be completely changed. As was the case in 2011, low-income adults are less supportive of completely changing the tax system than are those with higher family incomes. People with incomes of less than $30,000 are divided: 48% favor Congress completely changing the federal tax system, while 46% say only minor changes are needed. 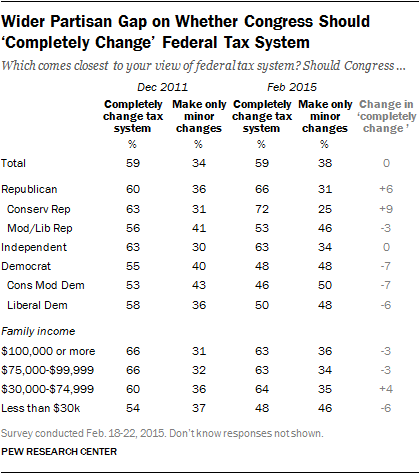 Among higher income groups, majorities support a complete overhaul of the federal tax system.